The frontman, famous for his enthusiastic dancing during the height of Britpop in the 90s, admitted that a recent performance left him breathless after just two songs and that he is determined to improve his stamina before the reformed band take to the stage in a mini-tour of America later this year. "We did two songs at the NME Awards recently, and I was tired after that so I realised I needed to do some exercise," Jarvis told Shortlist magazine. "I decided that although I'm the more mature performer I still want to move about a bit, so I've been to the gym a couple of times. I mean, I could lift up a table and chuck it." 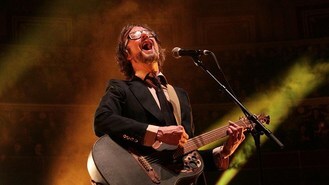 But while Jarvis is full of praise for exercise, the same cannot be said for his views on talent shows. "I gave up on The X Factor when they did that awful version of Heroes by David Bowie," said Jarvis, who now has a successful career as an award-winning BBC Radio DJ. "It's not music, is it? I don't want to sound like a fuddy-duddy, but to me it's everything I don't agree with. "The idea on The X Factor that these experts come in and tell you how [to be a pop star], how to style yourself and everything else. Also look at the level of experts. In a world where Louis Walsh can be considered an expert, something's wrong."